Screenshot by Victor Agreda Jr.
Pixelmator Pro: How Does It Compare to Photoshop CC? Photoshop is the undisputed king of photo editors, but for years the developers of Pixelmator have been challenging that throne, especially for amateurs and part-time professionals. 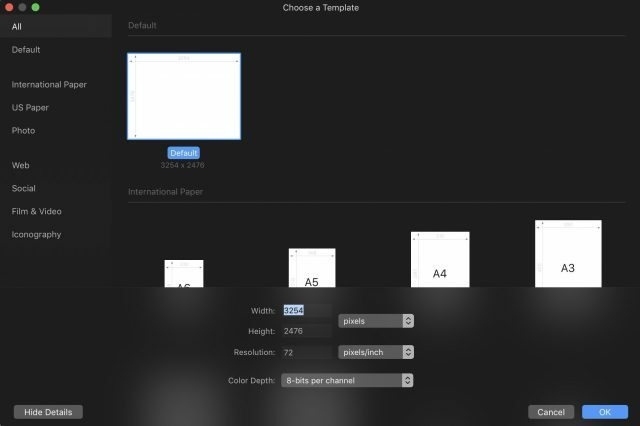 In 2018, the Pixelmator Team released Pixelmator Pro, aimed squarely at professional Photoshop users. But can the $59.99 Pixelmator Pro replace Photoshop, which will set you back at least $9.99 per month and as much as $52.99 per month? If you do heavy print work, you rely on other Creative Cloud apps, or if you’re plugged into a workflow reliant upon some of the connected features available in Creative Cloud, I can save you some time: forget it. 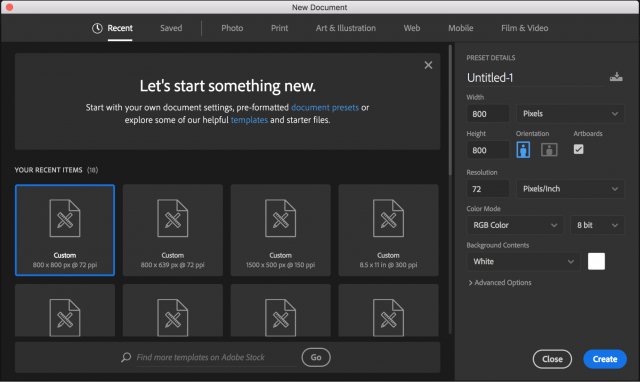 Adobe offers a decent deal for subscribers: between online storage, fonts, and other workflow niceties, you won’t easily replicate that with a single application. However, if you simply need to work with photos and manipulate them for the Web—which is likely a lot of Photoshop users out there—then Pixelmator Pro offers some advantages for a lot less money. Let’s begin with Photoshop’s interface for starting a new document. As you can see, Pixelmator Pro is more streamlined. This is an overarching theme: Photoshop has so many features that they overwhelm the interface, while Pixelmator Pro sacrifices obscure features for ease of use. You find that trade-off throughout the software, and as you might expect it’s often a balance between capability and simplicity. In fact, Pixelmator Pro begins perhaps too minimally, offering little more than a big, dark grey blank slate for your work. No layers, no apparent tools, just a big rectangle of workspace. If you move your mouse to the right, the tool palette appears with a lovely fade. This polish continues throughout, as fades and physics create a more tactile experience than things simply appearing. A number of pro photographers initially groused about Pixelmator Pro’s lack of interface customization. In Photoshop, you can change the default dark grey to black, white, or the more eyeball-friendly medium grey. I won’t go into why eye strain can be a problem with a “dark” interface as you can read more about that here. Luckily, Pixelmator 1.2 added a “light appearance,” but it’s available only in Mojave. 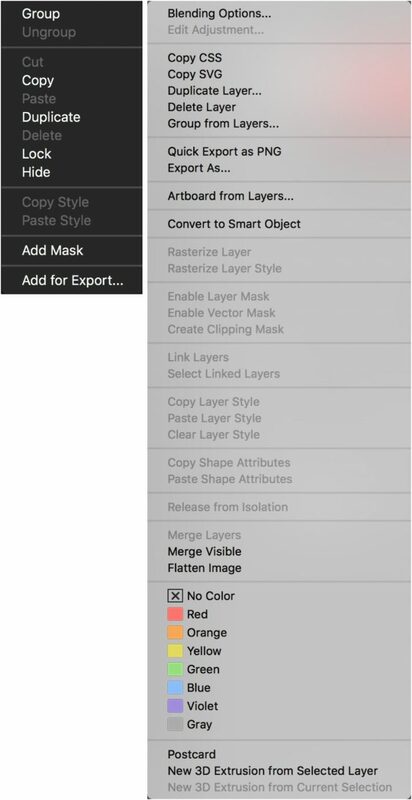 Photoshop presents layers with thumbnails in various sizes and adds masks or clipping layers visually. This interface has been around since the early days of Photoshop. Pixelmator Pro offers the option of no visible layers (the default), a thumbnail view, and a list view. Photoshop is an F-15 compared to Pixelmator Pro’s commuter jet here. If you’re doing Bert Monroy-level work, Photoshop options like giving layers colors or putting them in folders is an absolute must. For the rest of us, those options are likely overkill. However, Pixelmator Pro does have a few layer tricks of its own, like naming layers with machine learning. This auto-naming of layers is a nifty time saver if you’re bringing in a bunch of photos as layers all at once and want to avoid that “Layer 1” through “Layer 9999” problem. Does it work? About as reliably as any AI works these days, which is to say it does a pretty decent job. It managed to detect a cat, tree, food, and car—but hilariously labeled a pair of dice as “food” and a traffic cone as a bottle. Your mileage may vary, but it’s a starting point. You can also Control-click the layer to bring up other possible names. Presumably Pixelmator Pro will improve over time, but the closest match to the photo of dice was “game controller,” which is still pretty funny. The reason for this limitation stems from the non-destructive nature of what you do to each layer. Non-destructive editing can be really cool, or it can frustrate you. For example, if you zoom into a portrait and eliminate blemishes, save and close the file, and open it again later, those fixes aren’t “burned in” to the image itself. They can be undone! Each layer carries a memory of what was done to it. Unfortunately, by “undoing” those fixes made with the Repair tool, you’ll lose all the Repair tool changes. There’s no History palette like in Photoshop that would let you selectively iterate through revisions. That’s a bummer, and the biggest drawback in Pixelmator Pro may be this lack of a History palette. If you’re hooked on that tool in Photoshop, you’ll have a hard time in Pixelmator Pro. That said, Pixelmator Pro takes advantage of numerous macOS features, including Versions, which lets you move among previous saves with ease. In fact, as I alluded to earlier, the macOS features in Pixelmator Pro give it somewhat of an edge over Photoshop. By relying on macOS features like Metal 2, Wide Color, and CoreML (which powers its machine learning features), Pixelmator Pro moves like a speedboat to Photoshop’s battleship. I wound up launching Pixelmator Pro to do a lot of my photo work simply because (on a 2017 27-inch iMac, anyway) it launched instantly and ran like a cheetah. Speaking of which, Pixelmator Pro is not compatible with OS X 10.0 Cheetah—only 10.13 High Sierra and up. The latest version looks great on Mojave. Wrapping up our discussion of layers, if you do extensive masking work in Photoshop, you’re going to have a little adjustment period with Pixelmator Pro. There are masks, but they pretty much work like those in Pixelmator, which aren’t comparable to Photoshop’s. The good news is Pixelmator Pro uses machine learning to help with selections, and you have a variety of ways to modify selections. Naturally, Pixelmator Pro offers the usual suite of image editing tools, like selections, painting, vector shapes (including text), color and effect and warp tools, plus a suite of color and pixel repair tools. These aren’t always as deep as Photoshop’s, but the vast majority of tools you’re likely to use are there, including something called Recipes, which is similar to Adobe Lightroom’s presets. If you adjust an image a certain way and want to apply that same series of adjustments to other images, you can save it and apply it later. 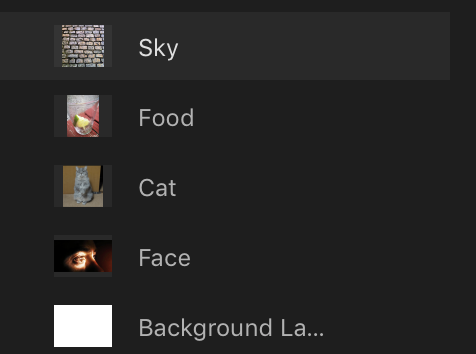 You can even drag these recipes to the Finder and share them with other Pixelmator Pro users. 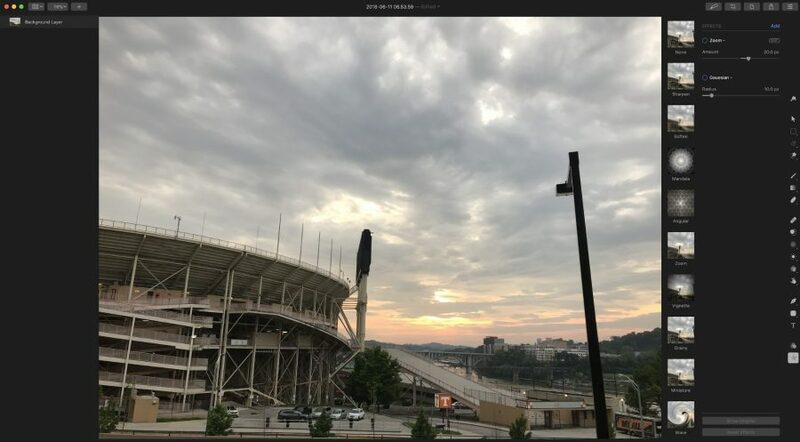 One of the things I love about Apple’s Photos app is its magical White Balance tool, and thanks to CoreML, Pixelmator Pro also uses machine learning to adjust this critical element of your photos. Instead of twiddling with a bunch of settings Pixelmator Pro intelligently analyzes the scene and does a great job of correcting colors. Photoshop seems to be lacking in this area. 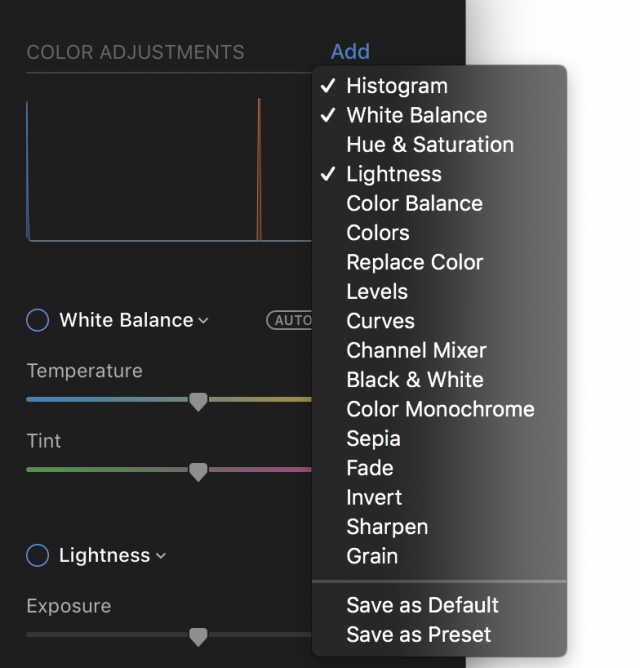 In fact, I came to prefer Pixelmator Pro’s color adjustment tools—but keep in mind the lack of adjustment layers and maybe it’s a wash, depending on your workflow needs. A minor quibble would be Pixelmator Pro’s adherence to minimalism here, as only a few tools are available in the Color palette at first. You must add tools like Hue & Saturation and Levels, but you can save your tool choices as a default or a preset. The Effects palette has the usual warp, blur, style, sharpen, and stylize tools that you’re likely to find in any image editing app. With both color and effects, you’ll see a handy series of thumbnails between your canvas and the tools, with a bunch of presets waiting for you. You can add to these, again streamlining repetitive work when you’ve found just the right blend of adjustments. A recent update to Pixelmator Pro added Automator workflows to batch process images as well. Another Pixelmator Pro tool I started to prefer over the Photoshop equivalent was the machine learning-powered Quick Selection tool. Photoshop users are no doubt used to its tunable magic wand and quick selection tools, but I found myself appreciating the speed and accuracy of Pixelmator Pro’s Quick Selection tool. Still, Adobe has added a Select Subject feature that uses the company’s Sensei AI to make the best guess about actual objects in an image. Which is better? Your mileage will vary depending on many factors. I found both to be adequate, but they often need a little adjustment. In both programs, you can add or subtract from your selection, and with Pixelmator Pro, you can subtract the overlap of two selections. However, a single button in Photoshop lets you select a portion of the image and turn it into a mask. The repair tools in each application are a bit different in ways that are worth noting. In Photoshop, Adobe has been working for years on its Content-Aware Move Tool, enabling you to cut out a boat in the water and move it, leaving water in what would otherwise have been a big hole in the underlying layer. It works pretty well and is just one of the repair tools in Photoshop. Others include a red-eye removal tool, a patch tool, and several different healing tools that let you remove stuff like wires from the sky by just painting. Likewise, the Repair tool in Pixelmator Pro allows you to remove stuff you don’t want. In the image below, I used Pixelmator Pro to remove the generic “person silhouette” you see when logging into a Windows 10 machine. I also tried to remove the pink-shirted person in the background. As you can see in the second photo, results vary depending on the complexity of what you’re trying to do and the surrounding pixels available. Photoshop has an advantage here, born from years of R&D. Since its launch, Pixelmator Pro has gained a slew of features, but perhaps most notable are tools that appeal to anyone making Web sites. There’s vastly improved SVG support, support for Apple’s High Efficiency Image File Format (HEIF), and a great tool for slicing and exporting images. Slicing tools allow you to carve up large images into smaller ones, making them easier to load on the Web. Vectors can now be created and edited like in Pixelmator, and there’s a robust set of vector shapes and tools available. Still, if you’re looking to create vector images exclusively, you’re going to want Sketch or Illustrator. Pixelmator Pro boasts new advanced compression options, export presets, and a truly handy Quick Export tool that makes it much quicker and easier to wrangle Web images than in Photoshop. This is yet another area where Photoshop’s juggernaut-load of features bogs you down. For those who care, Pixelmator Pro now supports the MacBook Pro’s Touch Bar. Another new Pixelmator Pro feature is automatic color adjustments using machine learning, which is handy when you’re working with a bunch of images. But Apple’s Photos app provides basically the same thing. You can also customize the toolbar, see live previews, and select color ranges. Finally, to help you figure out all these new capabilities, the Pixelmator Team has added a slew of video tutorials, not that there’s any lack of Photoshop tutorials. As welcome as these new features are, Photoshop has had most of them for a while. As I said at the beginning, if you’re using an advanced, multi-application and cloud-based workflow for your Web sites with Adobe’s Creative Suite, this may all feel like riding a tricycle after ditching your racing bike. Change is never easy. If you’re looking to ditch Photoshop and are considering Pixelmator Pro, I’d ask what deficiencies in Photoshop bug you the most. For me, it’s performance. By throwing every imaginable feature into the mix, Photoshop has become bloated. To use a car analogy, Photoshop is a crossover SUV, capable but not very efficient. It tries to appeal to a wide swath of users with a gigantic toolset, most of which you may never use, just as most SUV owners never take their cars offroad. By comparison, Pixelmator Pro is a Ferrari. It’s not the car you take out in the snow, but the one you love to drive because it’s fast and fun. In the end, that’s how I found myself using Pixelmator Pro over Photoshop. When I needed something done quickly and efficiently, I’d launch Pixelmator Pro in an instant and be happy (and done). However, if I needed to create complex text effects or deal with dozens of layers that needed a global adjustment, I’d fire up Photoshop and spend some time getting down to business. The bottom line? “Serious” users can’t really consider Pixelmator Pro as a Photoshop replacement, given the broad range of tools that Adobe has packed into its image-manipulation behemoth. Years of development have added everything from 3D printing support to pre-press tools in Photoshop. However, if you’re a photographer whose needs include tonal adjustments, some pixel replacement, and maybe a little bit of vector work added on top—all deployed with the speed and beauty of a proper Mac app—you just may be delighted by Pixelmator Pro’s capabilities and low price. Comments About Pixelmator Pro: How Does It Compare to Photoshop CC? Thanks for the exhaustive comparison between the two products. I started with Photoshop many moons ago, so I still gravitate towards that product. But I canceled my Adobe subscription a few years ago. Two reasons: 1) it was subscription, and 2) I really don’t do much work with graphics anymore. 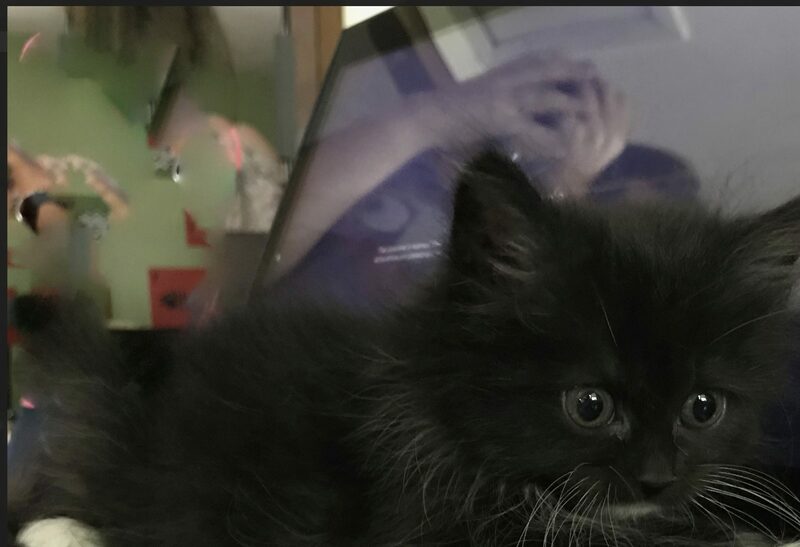 Pixlemator can be my future graphics buddy. Not sure if you’ve considered the usability of each application when those meat sticks–you and I know as fingers–are decimated by that 24-ounce furry black shredding machine. 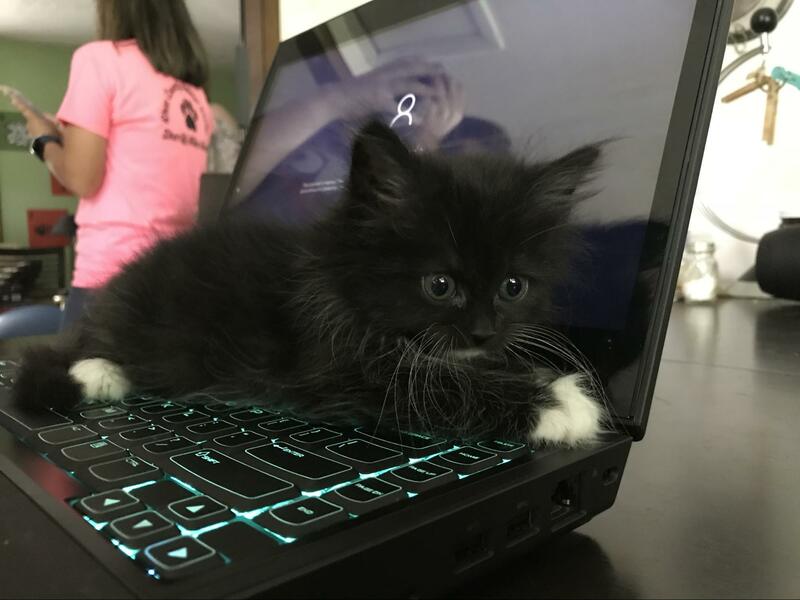 You probably didn’t notice it because of its ninja-like qualities, but if you look closely, it was on top of your laptop waiting to strike the entire time you were shooting pictures.